The Philippines' Pasig River, the cradle of early Manila civilization, has been selected as a finalist in the first ever Asia Riverprize by the prestigious International RiverFoundation (IRF) which recognizes and rewards organizations who are making a difference through effective river basin restoration and management programs. Compared to the 1990s when it was declared "biologically dead," the Pasig River's condition now has significantly improved. Although the Pasig River development is a work in progress, many areas along the historic river have already shown signs of aquatic life and it has already become conducive for transport, recreation, and tourism. 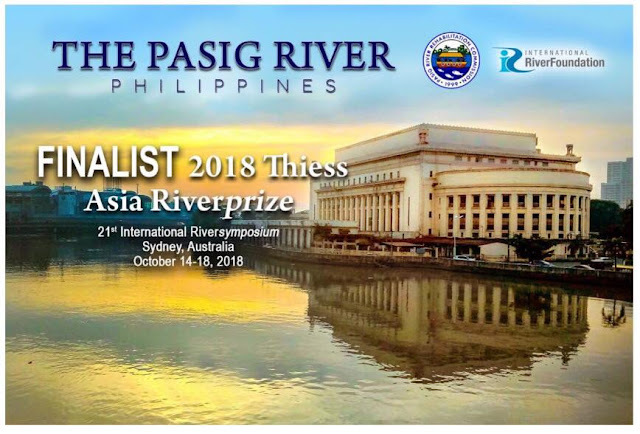 As one nation, the PRRC seeks everyone’s support to its Pasig River entry in the 2018 Asia Riverprize. The Pasig River's victory is the victory of the Philippines and every Filipino who works hard and shares the same vision of saving our waterways and the environment. It will be the triumph of all who believe that the dream of a clean and alive Pasig River is within reach!